A few years back on a trip to Indiana, we stopped by a gas station for the usual. This station was cool. 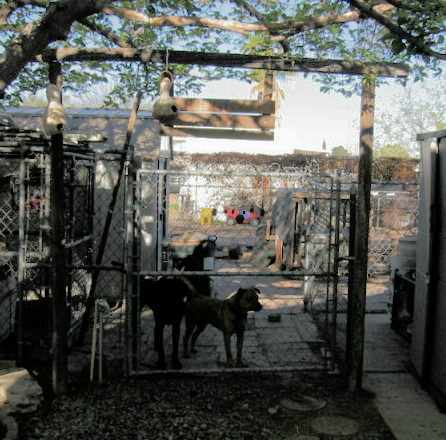 To the side of the main building, there was a special area just for dogs. 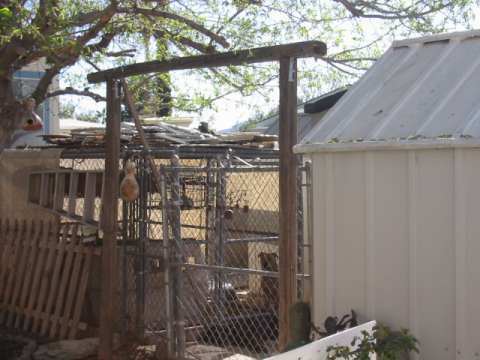 It had a wooden poled entrance on which hung a sign that read, "Doggy Pit Stop." 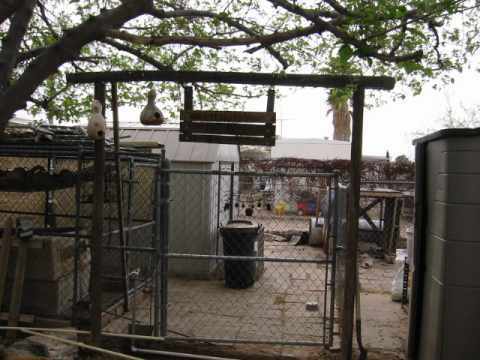 I took that cute idea and erected something similar over the main gate of my dog yard. I drilled and bolted together three yard logs. L-brackets reinforce the places where they kiss off. I used long bolts, washers and nuts for extra hold. The poles are buried in the ground about 1 foot with cement footers. I would have dug deeper, but the poles themselves weren't very long and I needed head space of over 6'5" to accomodate the tall members of the household. The sign itself is just the leavings of an old bookshelf I was about to throw away. I salvaged the boards, axed each to equal dimensions, then pyroengraved the words "Doggy Digs" on the first and second plank. The third plank has depictions of bones, flowers, balls, pawprints. NOTE: The spaces between the boards on the sign where you see sunlight coming through was not by accident -- they allow the wind to pass so it's easier on the sign over the weeks to come. I spaced the planks as you would when installing floor tiles - same technique. So easy. Here's a front view of the standards with the sign. 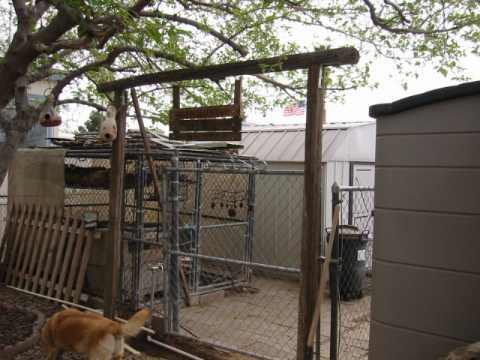 The bottom of the sign is just over 6'5" so easy passage is gained in and out the dog yard. The sign swings freely on two brass chains. The dogs don't care what it's on. They just want to keep an eye out on the birds. Did you notice the two birdhouses at top left? One is a gourd, the other is a ceramic gourd imitator. 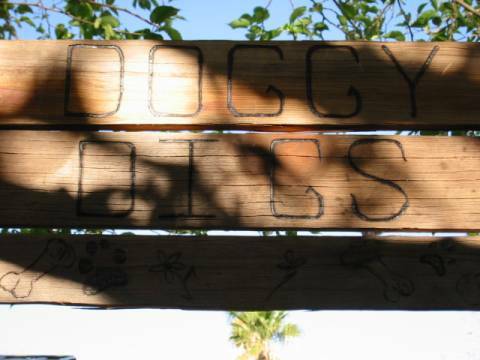 Here's a close-up of the sign itself - Doggy Digs. Sorry about the shadows. It's under my mulberry tree which is already starting to leaf out. The pyroengraver I use is wonderful tool -- the Detail Master Excaliber. I used a shadow tip for most of the lettering. or go to the fun links below. Kasin Keep gourd art gallery?